Our forecast is based on the convergence of three major trends that have developed over the past few years, including sustained high growth in global oil demand; limited CapEx investment; and shrinking undeveloped Tier 1 acreage. As the industry enters the upcycle, the changing market dynamics will present unique challenges and opportunities along the value chain. Investors preparing for the coming upcycle must consider targets’ addressable market dynamics, unique value proposition and positioning. 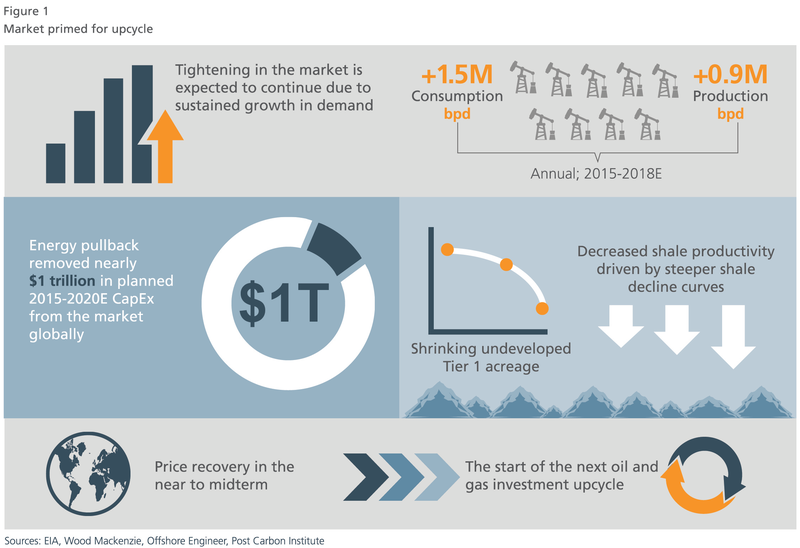 Increasingly tight production/consumption dynamics in the oil market will drive higher oil prices in the near to midterm, signaling the start of the next investment upcycle for the industry. We base this forecast on the convergence of three major trends that have developed over the past few years. Sustained high growth in global oil demand, with more limited growth in production; net demand is expected to continue in the near term (2018-2023E). Limited CapEx investment, which has impaired the development of larger but challenging oil sources; with few larger, longer-lead-time projects in the pipeline, production will be slower to respond to higher oil prices. Shrinking undeveloped Tier 1 acreage — a drop in shalewell productivity is coming, driven by steeper shale decline curves as drillers consume the majority of “Tier 1” acreage and find “Tier 2” rock less productive and harder to develop. Since 2015, global oil consumption has shown strong growth, increasing more than 1.5 million barrels per day (bpd) year over year from 2015 (95.3 million bpd) to 2018 (99.8 million bpd) — significantly higher than the longer-term average year-over-year growth of more than 1.3 million bpd during 2010-2018E. Strong demand growth has been particularly true in OECD regions, as a result of sharp rebounds in the 2015-2018E period — with average year-over-year growth of more than 0.3 million bpd compared with flat demand on average in the 2010-2018E term. During the downturn, Exploration & Production (E&P) companies sharpened their focus to emphasize production of lowest-cost barrels. As a result, portfolios shifted away from long-cycle production and toward short-cycle sources, effectively creating a gap in long-cycle assets in development (i.e., offshore, onshore conventional and oil sands projects). Finally, E&Ps’ narrowed focus on short-cycle sources (shale and tight oil) during the downturn provided flexibility, although this was possible largely due to the availability of undeveloped Tier 1 acreage. In the recent past, new Tier 1 wells would more than offset the declining production of existing shale wells and added to total production. However, as the inventory of Tier 1 acreage is consumed, we contend that Tier 2/3 acreage will require a greater number of wells relative to Tier 1 to offset production loss declines, let alone add to production. Tier 1 acreage, or “sweet spots,” typically account for only 10%-20% of the total play area.4 Overall, Tier 2/3 acreage is less productive and more difficult to produce. Given sharp shale-well decline curves, we expect that moving to Tier 2/3 acreage will start to impact productivity in the near-to-medium term, given where wells currently are in their lifecycle. Market tightening will lead to price recovery; operators indicate two to three quarters at approximately $75 per barrel will trigger CapEx investment in long-cycle sources. As the industry enters the upcycle, the changing market dynamics will present unique challenges and opportunities along the value chain. Within the upstream, operators will need to balance the need to rapidly add production (and ultimately high-quality reserves) with a degree of cost inflation inherent in more aggressive exploration and production activities. The downturn proved to many operators that they can manage vendor sourcing complexities to drive structural cost deflation; the challenge will be maintaining that discipline in the face of the euphoria typically generated in a high-oil-price environment. Further, as owners of ever-larger datasets, operators will need to reassess (and reimplement) analytics strategies regularly in order to maximize operations ranging from exploration to internal administrative functions — all while guarding against outsourcing data and analytics to an excessive degree or to the wrong parties. Operators with limited or poorly executed data analytics will increasingly be at a competitive disadvantage. As oil prices rise, the oilfield services sector as a whole will benefit from both increased intensity and volume of activity. The increased utilization will result in cyclical price reflation, and a period of sustained high oil prices will eventually result in some structural price reflation as some E&Ps simplify their operating models. However, these boons will exacerbate the constraints facing the service sector: limited availability of skilled labor and of well-conditioned equipment. Competition for these resources will be fierce, driving up input costs. In unconventional production, the crux will be the evolution of completion design as new areas are developed — which will affect equipment attrition (and hence design), input usage and handling (sand, chemicals, water and associated logistics), and labor utilization. To “win” in the oilfield services sector, clients must adopt a scenario-based strategy that gives them an actionable, responsive approach. In midstream, constraints in takeaway capacity and associated infrastructure in shale plays fueled activity during the downcycle. As new areas bring production online, players developing infrastructure will benefit from those opportunities. The stable, existing infrastructure typically operated by master limited partnerships (MLPs) is as “cycle neutral” a play as exists; however, the pending tax reform may cause a shift away from the MLP structure. Downstream will naturally face higher input costs for certain feedstocks, but should benefit from sustained demand for its refined products — and, depending on the product, stable to increasing pricing. Investors preparing for the coming upcycle must, as in prior cycles, consider targets’ addressable market dynamics, unique value proposition and positioning. In this particular upcycle, assessing technology position, readiness and cost-control discipline will take on additional importance, as energy transition looms on the horizon. L.E.K. Consulting’s expertise all along the niches and sub-niches within the value chain positions our firm to best advise you as you make these decisions.